One of my favorite online games at the moment is Team Fortress 2. I used to play the original Quake World Team Fortress back in 1998. When I was searching for a video for this post, I found one of the old guilds I used to belong to at PlanetFortress.com. I was excited when I heard they had finally finished a true sequel after 7 years of development. The game was worth the wait! 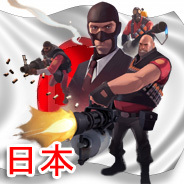 If you play Team Fortress 2, feel free to join my TF2 Japan Community ã€Žæ—¥æœ¬äººTF2å…±åŒä½“ã€ over at Steam. We have about 500+ members from Japan, or interested in Japan. If you are looking to make some new gamer friends from Japan, definitely check it out. If you have no idea what Team Fortress 2 is, here you go, but be warned, this game is addictive!